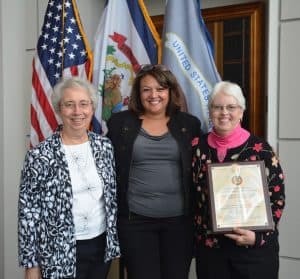 Congratulations to the Sisters of St. Joseph Health and Wellness Foundation, a sponsored ministry of the Congregation of St. Joseph, which was selected as the recipient of The U.S. Attorney Award for Distinguished Service – Allied Professional Award – because of its funding and advocacy on behalf of the victims of human trafficking in West Virginia. 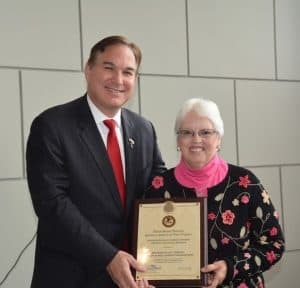 The award recognizes the foundation as champions for victims of human trafficking throughout West Virginia and was presented on October 25th at the Robert C. Byrd U.S. Court House in Charleston, WV. Michael B. Stuart, Chief United States Attorney for the WV. Southern District; and Sister Helen Skormisley, CSJ, Executive Director of the SSJ Health and Wellness Foundation. Sister Rose Ann Hefner, CSJ, Board Chair of the SSJ Health and Wellness Foundation;Tracy Chapman, Victim Witness Coordinator for the U.S. Attorney’s Office; and Sister Helen Skormisley, CSJ, Executive Director of the SSJ Health and Wellness Foundation.